Aim: Performing single incision laparoscopic cholecystectomy in a safe and feasible way in a more public approach. Methods: Between August 2009 till September 2011 the surgical teams, taking in consideration ultrasonographic thickness of gallbladder wall, previous surgery on superior abdominal wall, and no signs of acute inflammation, reviewed all patients admitted in the surgery department in Pelican hospital in Oradea, Romania, once more. Pacients who passed these tests were proposed for single incision laparoscopic cholecystectomy. We had 715 pacients admitted for cholecystectomies, out of which 180 were proposed SILS cholecystectomy. Only 132 pacients agreed, and a SILS cholecystectomy was tried in all cases. Our technique involves a 2 cm transombilical incision, through which we introduce our first 10 mm trocar and perform a exploratory laparoscopy. If the case seems feasible for SILS cholecystectomy, we continue by placing a second trocar, a 10 mm one, just lateral to the first one. The first trocar is used for the optics, and the second one is used for dissector, hook cautery, scissors, needle holder and clip applicator. After placing the trocars we introduce 3 transcutaneous sutures, used to retract the gallbladder in different positions. The first suture is place in the last intercoastal space in the midclaviculary line and retracts the gallbladder fundus. The second and thrid sutures are place in the sides and are used to move the gallbladder from side to side. The cholecystectomy is performed the same as in classic laparoscopic cases. From January 2011 we started using the double curved Dapri-Stroz forceps for SILS cholecystectomies, thus elimination the need for the 2 transcutaneous sutures on the sides used to move the gallbladder form side to side. 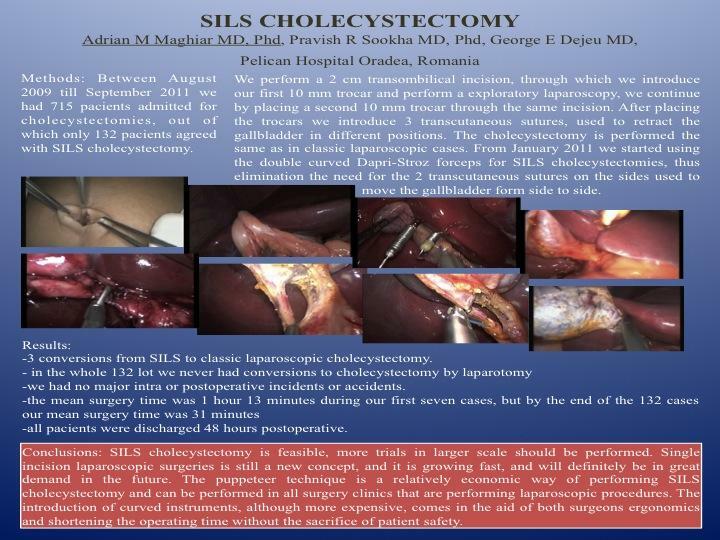 Results: We had 3 conversions from SILS to classic laparoscopic cholecystectomy. 2 of these cases were in our first seven cases, both for bleeding difficult to control through the SILS technique, the last one in our first 70 cases for the same problem. In the whole 132 lot we never had conversions to cholecystectomy by laparotomy and in the same time we had no major intra or postoperative incidents or accidents. Our mean surgery time was 1 hour 13 minutes during our first seven cases, but it decreased gradually, showing a very lean learning curve, and the end of the 132 cases our mean surgery time was 31 minutes. All pacients were discharged 48 hours postoperative. Conclusions: SILS cholecystectomy is feasible according to us, and of course more trials in larger scale should be performed. Single incision laparoscopic surgeries is still a new concept, and it is growing fast, and will definitely be in great demand in the future. The puppeteer technique is a relatively economic way of performing SILS cholecystectomy and can be performed in all surgery clinics that are performing laparoscopic procedures. The introduction of curved instruments, although more expensive, comes in the aid of both surgeons ergonomics and shortening the operating time without the sacrifice of patient safety.